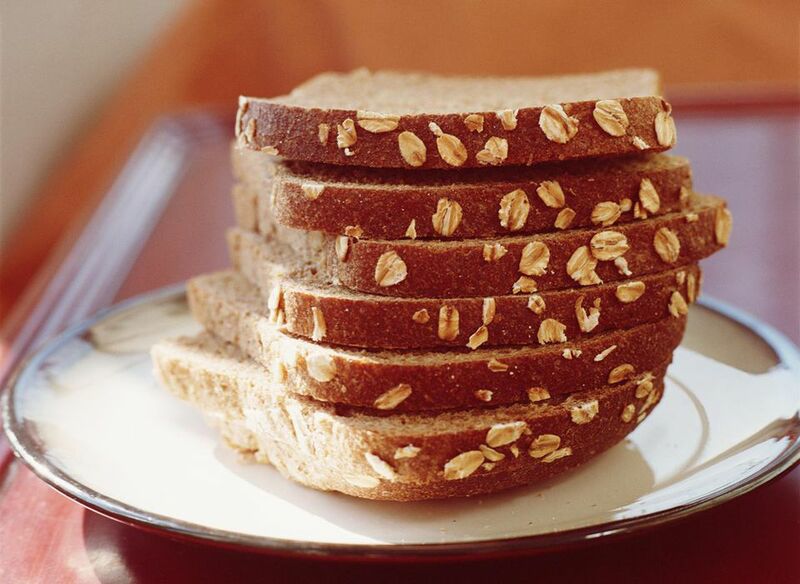 This bread is based on this other Oatmeal Bread recipe in this collection. I tweaked the recipe while liberally stealing ideas from master bakers and came up with a small loaf with wonderful taste and a crunchy crust. Makes one, 600 gram loaf (1 lb, 5 oz.). You can double this recipe, but keep the loaves the same size because the bread is very moist. Prep time: Starting after dinner the night before, you will bake the loaf the next afternoon. M​ix oats and whole wheat flour in a bowl. Add the boiling water and stir. Stir in the honey, molasses, oil and salt and let cool to lukewarm (about 1/2 hour or more). It's OK if it's room temperature, too. To the bowl, add the 1/4 teaspoon of instant yeast, the extra water and one cup of whole wheat flour. Here, I used whole wheat white flour from King Arthur. Stir until flour is wet and dough is homogeneous. Pat the dough into a one-inch high rectangle. Knead by folding the dough over into thirds (like a letter) and then patting or pulling it back into a rectangle. Don't turn the dough 90 degrees. You want the gluten strands to line up in straight rows, which is hard enough with all that oatmeal and wheat bran. After 3-4 hours at room temperature, gather the ungainly dough into a ball, wrap in plastic wrap and place in a bowl in the refrigerator. (My dough stayed there for 16 hours). Take dough out of refrigerator and fold 2 times on a floured board. Let rise until the chill comes off the dough and you see it get bigger in size. Form into a boule (round) or batard (long) shape, pulling the dough from the top to the underside and pinching closed on the bottom. Because of the oatmeal, this will not be smooth and the dough is still sticky at this point. Place the dough, top side down, in a bowl (or on the baking sheet) with a quarter cup of oatmeal in it and coat with oatmeal. Leave in proofing basket (here, my two quart Corning-ware vegetable bowl) until risen, about 2 hours. After the first hour, turn on the oven to heat to 450F, preferably with a baking stone. Place the loaf in the oven on the cornmeal or flour-strewn stone and turn down to 400F. Bake for 30-40 minutes, or until the internal temperature reaches 190F. Note: Those hard crusts you love are created with steam. You may create steam in the oven for the first 5 minutes. Heat an old roasting pan on the rack below the stone and pour 2 cups of boiling water in it right after you put the bread in the oven. Spray water the sides of the oven with a squirt bottle two or three times in the first 5 minutes. Turn oven down to 400F and bake for 30 minutes or more, until the internal temperature reaches 190F. Bread steams itself dry, so let the bread cool for at least 2 hours before slicing or it may seem gummy inside.